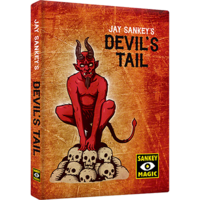 Today, when you order "Devil's Tail (All Gimmicks & DVD) by Jay Sankey", you'll instantly be emailed a Penguin Magic gift certificate. You can spend it on anything you like at Penguin, just like cash. Just complete your order as normal, and within seconds you'll get an email with your gift certificate. Love ya Jay! The most prolific magician today, in my humble opinion, adds a new twist to one of his old classics. Leaving Home was cool I loved the idea, the string around the neck with the key was a nice "show me magic" trap. However I couldn't keep the keys from "talking". With D.T. 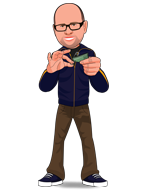 The props are better eye candy and the talking is now easier to mute. Yes, I knew it was "Leaving Home" revamped. But when an old classic is made better, you gotta go for it. Only a 4 because it's not new. I love the moves and sleights on this video, but my problem with it is two things. First I didn't get a long enough cord to cut for the rope routine. I would have liked about an extra foot. Two the video is shot in his house on a computer camera and he has no helpers in the studio. He has to constantly move the camera manually. I still got all the moves understood but it's just a little unprofessional. He does not perform for any spectators so expect to make your own routine. But I love the sleights Sankey is Sneaky!